This is a new weekend column brought to you by the founders of Niceties Tokens, Liz and Pete of Team Nice. 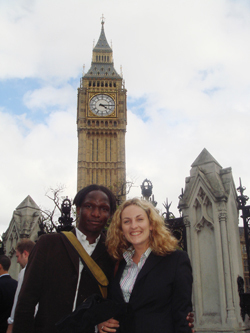 So this week, Jacqui Lait MP, the Shadow Minister for London invited Pete and me to Westminster for a chat about niceness. 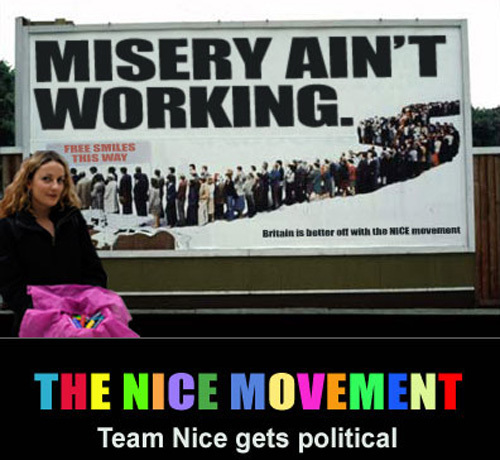 Before I start this – I must stress that Team Nice is not politically biased towards any political party. All we want to do is improve niceness. Jacqui, Pete and I drank tea and spent the next hour or so discussing social responsibility, niceness, courtesy and what she thinks of Londoners with poor manners on the daily commute. As a child, it was drummed in to her to stand when an adult entered the room, be on constant lookout to give up your seat to anyone who needed it, and always to say please and thank you. Skip forward to when I was kid. Fifteen years ago, I was one of those grubby little teenagers standing outside Sidcup McDonalds in a little grubby gang, drinking MD 20/20 through a straw; but we were never gobby to anyone older than us. Nowadays, my schoolteacher friend says her pupils regularly swear at her and her colleagues. And of course it’s not just kids – with 4 out 5 pregnant women forced to stand on tube journeys. London has lost its manners. Jacqui spoke about how society in the stiflingly starched-up 1950s contrasted greatly with society in the free liberty of the 1960s, and over the decades she has seen the pendulum swing from one extreme to another. So I asked her, in this increasingly anti-social world that we seem to have developed, what’s going to happen to us? Well perhaps it’s time for the pendulum to swing back? With our politicians talking about social responsibility, social networks like FaceBook and MySpace and, um… Team Nice, are we all getting a little bit rebellious against this near socio-pathic culture that has sprung up in the past few years?